Winmate rolls out a new cost effective and high performance industrial Box PC, which is the best choice for Dual-Display and Industrial Applications. 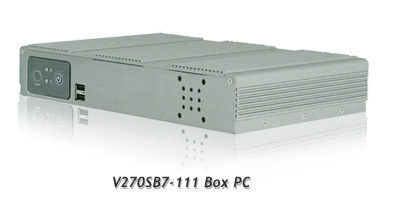 V270SB7-111 Box PC is equipped with the VIA C7-M NanoBGA2 1.6GHz processor (15Watt) and the VIA VX700 All-in-One System Chipset. It is designed to enable high quality digital video streaming as a small form factor Industrial PC. The VX700 features the embedded VIA UniChrome™ Pro II 2D/3D graphic engine, DDR2 533MHz support and dual-display support to ensure a rich overall entertainment experience. Outstanding connectivity features include four USB 2.0 ports, two Serial ports, one Giga LAN and PCMCIA slot for expansion functions. Thus, V270 SBC is designed to satisfy most of the applications in the industrial computer market, such as Gaming, POS, KIOSK and Industrial Automation. It is a compact design to meet the demanding performance requirements of today's business and industrial applications. 1 x VT1708A High Definition Audio Controller, up to 7.1 high definition audio channels.